His name is Anthony and I have been acquainted with him since 2010. He has followed several of my program progressions with his colleagues over the past 5 years. Developing a rapport and mutual understanding of goals, approaches, and expected outcomes with my new Movement Specialist happened more quickly this time. I will always need to take the time to bring new fitness professionals “up to speed” about past efforts. This includes sharing program elements and adaptations that have been put into place. I have to provide a clear sense of what has worked well and what hasn’t worked after several attempts. Part of this process includes sharing video clips and snapshots to provide a visual context of how my body responds to exercise. I also expect new people I work with will need opportunities to learn through trial and error or what I call “experiential learning”. I allow the professional to guide me through a variety of movement sequences to see my range of motion, resistance from spasticity, and points of failure first-hand. With this approach, a lively dynamic is born. During these transitions I am always reoriented to the foundations of my program. I revisit principles of movement such as stability, balance, motor learning, and motor control. I find that I work harder and discover effective ways to quickly communicate important goals of continuity and advancement. I have to ensure that I do not regress or lose the gains made in my previous efforts. Taking Kerry on as a client was something that I openly volunteered for. I knew I could really help her with her goals to walk device free full-time. I had seen Kerry working out for over 5 years, so I knew her. I witnessed parts of the exercise and walking program that she was working on. When I start working with a new client, I usually gather information from fitness assessments like cardiovascular endurance, flexibility, and strength. While I performed some of these assessments with Kerry, my full assessment came from Kerry’s past experience. This included a review of her previous program (video) and a review of the goals she was working toward. When I work with Kerry, I do not think that I am working with a person with a disability. Each and every person I see has strengths and areas that we need to work on. I see the same elements working with Kerry. Over time, I have seen her progress. I know where she started and how far she has come. This knowledge has helped motivate me to start thinking outside the box, while still following the general physiological principles that I have learned. We all have motor behaviors that we are born with. Kerry skipped certain stages of motor development due to her disability. She has had to learn or is re-learning these stages. Motor learning is a process of acquiring a skill through practice and assimilation. We are working to develop neurologic processes that result in the ability to produce smooth and accurate movements. Kerry uses a Fitness Sled as part of her program. Sled training provides beneficial leg, core, and upper body exercise. When Kerry pushes the sled, the resistance of the sled provides feedback to engage muscles that were not previously working for us using other modalities. 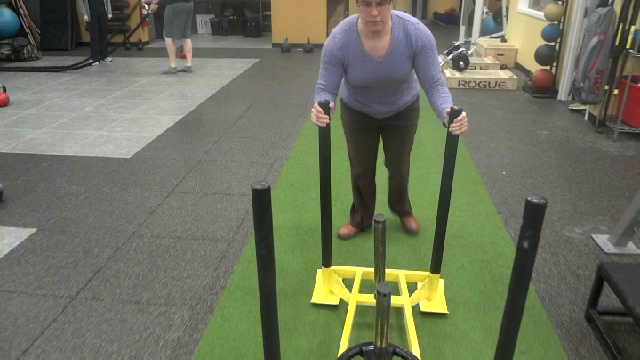 When Kerry uses the sled, she has the ability to produce hip and knee flexion. With adequate hip and knee flexion, we are starting to see stepping motions rather than a hip swinging motion. We are trying to build reactive stability through the hips and core in a few different ways. First, we are doing it in quadruped position, with arm reaching. We are also using tall-kneeling to build reactive stability. I am working to support Kerry to develop basic movement patterns. I am working to help my client achieve success in her long term goal, regardless of the challenges we may face. ** Kerry’s Co-author Anthony Demetriou holds a Bachelor’s of Science in Exercise Science from Manhattan College and a Master’s of Science in Exercise Science from California University of Pennsylvania. [i] Trevithick, P. (2005). Social Work Skills: A Practice Handbook (2nd ed.). Maidenhead, England: Open University Press.